David Arnold lives in Lexington, Kentucky, with his (lovely) wife and (boisterous) son. He is the New York Times bestselling author of Kids of Appetite and Mosquitoland, and his books have been translated into over a dozen languages. Previous jobs include freelance musician/producer, stay-at-home dad, and preschool teacher. David is a fierce believer in the power of kindness and community. And pesto. He believes fiercely in pesto. You can learn more at davidarnoldbooks.com and follow him on Twitter @roofbeam. "A big-hearted book that will make you feel nostalgic for your teen years, Kids of Appetite will leave you cry-laughing until the very last page." 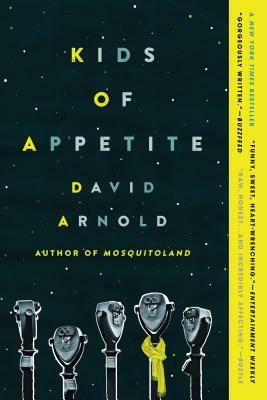 —Brit + Co.
"In Mosquitoland, David Arnold has created one of the most unique narrative voices to show up in the world of young adult fiction. I don't remember life before Mim, and I don't want to. Mosquitoland is equal parts sharp, sad, and surreal. This book is genius, war paint and all."